Billy Crystal and Ralph Lawler, an underrated announcer who had the impossible and unenviable task of announcing in city that belonged to Vin Scully and Chick Hearn, have been the Clippers’ biggest stars — and constants — until recently. 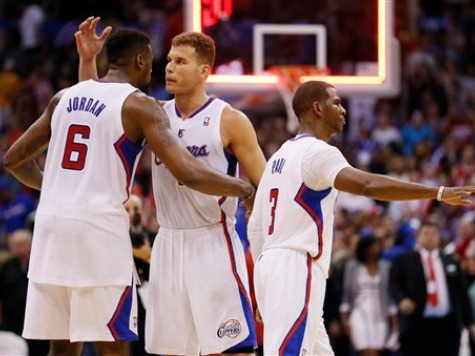 The Clippers have emerged as one of the NBA’s “it” teams after they added Blake Griffin and Chris Paul (after the NBA denied a deal to the Lakers), and new coach Doc Rivers quickly established that he was the new sheriff in town, ordering the Lakers championship banners to be covered up at the Staples Center when the Clippers played in the arena they share. And now the coach the Clippers traded for with the Boston Celtics will try take the franchise that has spent the longest time in the NBA basement straight to the penthouse. The Clippers are the only game left in town after the Lakers disastrous season, and Rivers is hoping he can bring a title to Tinseltown as the playoffs begin on Saturday in Los Angeles against their hated rivals from Northern California — the Golden State Warriors. Oh. Me. Oh. My. Indeed. Rivers won a title in 2008 with a talented trio of Boston Celtics, and he is trying to guide Los Angeles’s Blake Griffin, the all-world high-flyer who has had a reputation for being soft, DeAndre Jordan, who has often disappeared during the playoffs, and Chris Paul, the point guard who is arguably the toughest and most clutch player on the team. According to a Los Angeles Times report, he convinced Jordan to become his team’s defensive captain and asked Griffin to diversity his game and take more mid-range jumpers. Days off have become routine for a team that has slogged its way through an 82-game schedule. Beat reporters have come to expect an email from the media relations department reading: “The Los Angeles Clippers will not practice tomorrow” after almost every game. Most players show up anyway for individual workouts, a tribute to the collective mission. Rivers tries to lighten his players’ mental workload as well as preserve their bodies. The coach repeatedly heard that his players hated the long film sessions from previous seasons, so he plays only snippets as they stand around a screen next to the practice court. Things seemed rocky at the beginning of the year, when Matt Barnes got ejected after sticking up for Blake Griffin and rumors about Griffin being “soft” started swirling around in earnest again. But spark plug Jamal Crawford told the Times that Rivers ultimately got the team to buy in. And the Warriors, who have literally fought with the Clippers over the years as the rivalry has budded, may be the perfect team to get the Clippers to gel even more. It’s not Dodgers-Giants. But with the Lakers having one of the most ignominious seasons in the franchise’s history, Clippers-Warriors right now is the NBA’s version of Dodgers-Giants. Game one is Saturday at Staples Center at 12:30 PM. Fasten those seat belts — even before Ralph Lawler’s reminder.